Is Killing One’s Computer Legal? Is it against the law to intentionally kill one’s computer? Rip its Microsoft Word software out of its database–or wherever the evil program lurks–toss it to the ground and stomp on it a few times. Is that legal? The most vile part of the Word program is the Header and Footer. For the last four days I spent hours trying to get the Footer to work right. At first I thought that it was just that the pattern I am writing up is cursed, not meant to see the light of publication. Yes, the knitting-powers-that-be would do something like that. But the more time I spent working on it I began to feel that this snafu is bigger than just the whimsy of the knitting powers. They have help from my cursed computer. For some obscure reason, the program will provide the proper Footer on the first 2 pages of the pattern and ignore the remaining 5 pages. I’m at the point of trashing the whole pattern from the computer and entering the entire pattern again. I really don’t want to retype or redesign the schematic page yet again. The time it would take is time I don’t have right now. On to something lighter. I finally have my logo. I think my graphic designer captured what I wanted beautifully. Poor girl, I threw her some curves during the designing process but she handled them with dignity and grace. The logo will appear on all my designs from this point forward providing I don’t kill my computer in the mean time. I am in the middle of a test knit for a beautiful sock. The pattern is written so well it is a pleasure to work from it. The pages have a lovely, clean layout that make it easy to find information quickly. The wording is straight forward and concise. It’s just a pleasure to read. Never fear, though, the Art of Masochistic Knitting is in full swing. But that is for another post. Right now I’m going to turn this computer off and pretend it doesn’t exist for the next three hours. Then I will commence to do battle again with Word and the Footer. I am almost at the point where I miss the typewriter. I can’t believe it is Friday already. I’m still working on things that needed doing on Monday. Knitting progresses in a masochistic way. From have no socks on the needles I’ve gone to having two. One is toe-up the other is cuff down. The toe-up is a test knit so it is the one I am mostly concentrating on. So far it’s proven to be a little devil. One of the purl stitches is coming out wonky and for the love of me I can’t figure out what I am doing differently on that specific purl. Instead of ripping back (be still my forthcoming migraine) I am going to drop the stitch back to where it was behaving and with crochet hook in hand bring it back up. Then I’ll do an eastern purl to keep it in line for the rest of the sock. Because the sock is a test knit, I can’t show it to you right now, but it is a wonderful pattern. When I first saw the pattern on Kiwi Yarns blog I knew exactly what yarn it would pair with in my stash. I am delighted to report that yarn and pattern are working together nicely. On the masochistic side, I had to go down to US 0 double-pointed needles to come as close to gauge as I could get. Still, I was off one stitch. That meant I had to modify the pattern without modifying it. I studied the pattern until I figured out where I could lose 4 stitches without them being noticed. Naturally, I didn’t have US 0 dpns in my bag full of dpns so I had to race out to buy them. It is a rule in masochistic knitting that no matter how many knitting needles I have I will not have the kind or size needed for the specific project at hand. As I stepped out the door I was greeted by a wind chill of -25 degrees (-31 Celsius). My eyeballs almost froze. But again, this is part of the beauty of masochistic knitting: the weather shall be perfectly horrible on the day I need to get any knitting supply. The Arctic blast is suppose to stay with us all weekend. That’s okay. I plan to be wrapped in my hand knit shawls, with my hand knit fingerless mitts on, knitting teeny-tiny stitches on my teeny-tiny US 0 needles. 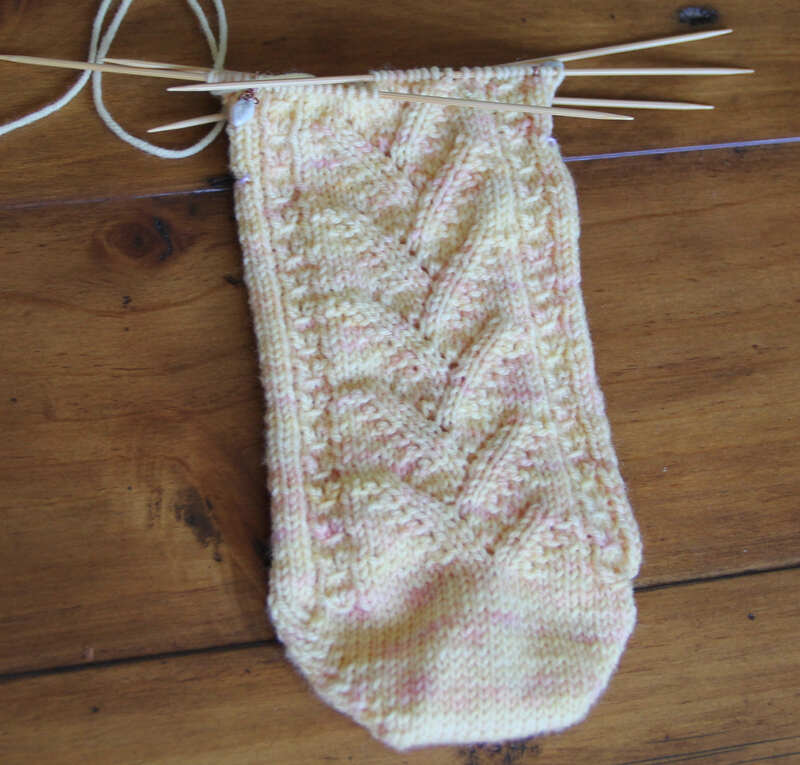 Can one really be a knitter and never have knit a sock? The rational answer is absolutely. But if practicing the Art of Masochistic Knitting the answer is of course not. Socks pose special little dilemmas that other projects don’t. For instance, the toe. I have made two drawers full of socks over the years: one for The Skipper and one for me. Except for 2 pairs, all were worked toe-up. My basic go-to toe is the short-row. I’ve never had a problem with it until lately. The short-rows and wraps on the last three pairs of socks were creating holes. I changed the type of short-row from wrap to yarn over and it seemed to work…more or less. The holes were not there but the inside of the sock lacked the reinforcement to make it wear longer before toes started peeking through. Also, the yarn over short rows worked well for my small size, but on Skipper size socks it was less effective. Last night after I completed the Back of Feelin’ Groovy, I decided to use the notorious sock yarn I had left over from my Train to Maine hat and cast on a pair of socks for The Skipper. The yarn is Dream In Color Smooshy in the Peacock Shadow colorway. The colorway gave me a bit of a problem when knitting the hat. While it didn’t stain my hands, it stained the needles. After completing the hat, I decided to see how much the yarn bled. I put it in a bath and lo and behold no bleeding. I squeezed and prodded the yarn in the water and still no bleeding. I laid it on a white towel, working the majority of the water out of the yarn by gently stomping on it and no bleeding. Not even a hint of blue transferred to the towel. I let it dry, hanging from a nail in the ceiling of the cellar, well away from Yarn Rascal who was way too attentive to the washing and stomping process. It wasn’t long after I cast on my usual provisional short-row cast on that I realized I needed a different starter. I possess enough written material on socks both from the toe-up and cuff down that it could be considered encyclopedic. If it’s been written about I either have the book or the article tucked away in a folder. Within the tomes of this written wisdom are a myriad of ways in which to cast on for a toe-up sock. Here is the beauty of when knitting crosses over from being a relaxing, enjoyable pastime to the Art of Masochistic Knitting. In all that material I could not find the specific cast on I was picturing in my head. I had stumbled across it on the internet months ago and I didn’t bookmark or print it out. In my quest to be a more flexible individual, I talked myself into abandoning the cast on I wanted and instead give a try to those that were at hand. Surely one would work. Fast forward a few hours–two to be precise. The blue of the yarn was starting to stain the needles and this time my hands. At one point, I inadvertently made a Cat’s Cradle from four double-double pointed needles and the yarn. Hardly the look one wants when trying to knit the toe of a sock. Blessedly, when I glanced at the clock I realized that it was bedtime and I could put the whole mess away. Which I did, making sure everything was secured in Rubber Maid bin with locking top to prevent Yarn Rascal from gaining the yarn during the night. The Cat’s Cradle thing really, really interested him. He desperately wanted the yarn and needles. I went upstairs to bed, determined not to think about the cast on for the sock. But before I changed into my PJs I had the computer turned on and was scouring every knitting internet site I know looking for the one I had in mind. In the meanwhile, Yarn Rascal could be heard downstairs trying to break into the bin with the needles and yarn. The moment I finally found the cast on the computer started making popping sounds from one of it USB ports while Yarn Rascal simultaneously squealed with delight. He had breached the bin. I dashed downstairs saving him and the yarn from certain disaster by bringing him to the bedroom and closing the door. He was informed that he was in lockdown for the rest of the night. When I went back to the computer it was still popping only worse. I prayed that it would just work for a few more moments while I sent the cast on info wirelessly to the printer. That’s when the printer sent back its wireless message that it was out of ink. Printing failed. I closed my eyes, took a deep breath and realized I was at the pinnacle of the Art of Masochistic Knitting.